Toronto, ON – The Ontario Hockey League today announced that Vancouver Canucks prospect Michael DiPietro of the Windsor Spitfires is the 2017-18 recipient of the OHL’s Goaltender of the Year award. DiPietro becomes the first Spitfire to earn the award after playing in 56 games this season carrying a 29-21-3-1 record. He produced a league-high seven shutouts while posting the league’s third lowest goals-against-average with a mark of 2.79 and a save percentage of .910 that tied for fourth overall. His seven shutouts not only led the OHL this season but established a new Spitfires single season record surpassing the mark of six he set in 2016-17. During the 2017-18 campaign DiPietro finished fourth in minutes played at 3,267 and finished sixth overall with 1,544 saves for a rebuilding Spitfires club that finished sixth in the Western Conference standings. The Red Tilson Trophy nominee had 22 appearances of 30 or more saves and helped the Spitfires maintain the league’s fifth best penalty killing efficiency at 81.2%. 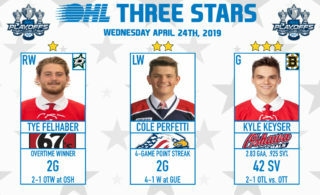 He earned OHL ‘On the Run’ Player of the Week as well as Vaughn CHL Goaltender of the Week honours for the first week of the season, was recognized as the Best Puck Handling Goalie in the annual Western Conference Coaches Poll, and finished tied for the league-lead with 13 first star recognitions in games this season. DiPietro represented Team OHL in a 4-2 victory in Game 4 of the 2017 CIBC Canada Russia Series before receiving an invite to Canada’s National Junior Team Selection Camp in December. He is currently competing with Canada in pre-competition for the IIHF Men’s World Championship. 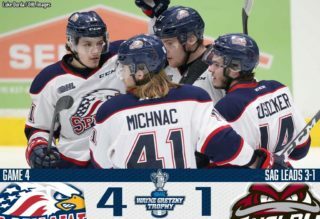 An 18-year-old from Amherstburg, Ont., DiPietro joined his hometown Spitfires as the top goaltender chosen in the 2015 OHL Priority Selection at 23rd overall. In three seasons he’s compiled 75 career wins and sits just three behind franchise record holder Andrew Engelage with 78 from 2006-09. His 15 career shutouts are also one shy of the OHL record 16 set by Thomas McCollum between Guelph and Brampton from 2006-09. 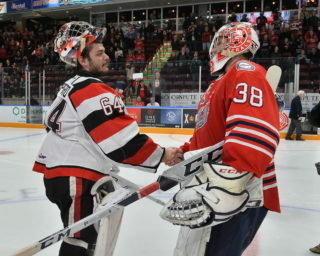 Last season he backstopped the Spitfires to a Mastercard Memorial Cup title winning on home ice where he was named top goaltender and to the tournament’s all-star team. He was selected by the Canucks in the third round of the 2017 NHL Draft going 64th overall. The OHL Goaltender of the Year is awarded to the league’s most outstanding goaltender as selected by OHL General Managers. Teams were not permitted to vote for a goaltender from their own hockey club. Goaltenders received five points for a first place vote, three points for a second place vote, and one point for a third place vote. DiPietro, who finished third in voting last season, received 70 points atop the voting process. He finished just slightly ahead of Carolina Hurricanes prospect Jeremy Helvig of the Kingston Frontenacs who was runner-up with 65 voting points, followed by Los Angeles Kings prospect Matthew Villalta of the Sault Ste. Marie Greyhounds who finished in third place with 21 voting points. The award was first presented in 1987-88 to Rick Tabaracci (Cornwall) with other notable winners including Manny Legace (Niagara Falls 1993), Craig Anderson (Guelph 2001), Steve Mason (London 2007), the league’s only back-to-back winner Mike Murphy (Belleville 2008 and 2009), Jordan Binnington (Owen Sound 2013), Alex Nedeljkovic (Plymouth 2014), Lucas Peressini (Kingston 2015), Mackenzie Blackwood (Barrie 2016), and Michael McNiven (Owen Sound 2017). 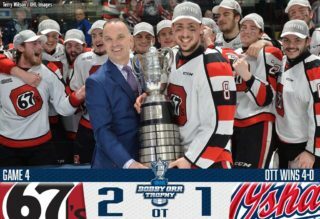 DiPietro will be formally presented with the OHL’s Goaltender of the Year Award on Wednesday June 6 at the OHL Awards Ceremony held at the Hockey Hall of Fame in Toronto. He is also the OHL’s nominee for CHL Goaltender of the Year to be announced on Saturday May 26 at the 2018 Mastercard Memorial Cup in Regina.